154 pages | 7 B/W Illus. 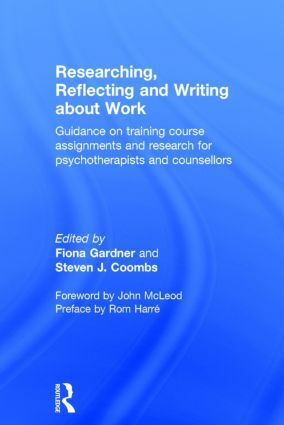 Researching, Reflecting and Writing about Work provides a guide to the research skills and critical thinking required to complete a research project for professional learning courses in counselling and psychotherapy. dilemmas and tensions involved in ‘research at work’. Key learning points and reflective exercises are included throughout and theory is supported by contributions detailing specific learning experiences from a variety of work settings, including the public sector, an organisation, in the community, and as an independent counsellor in a voluntary agency. There is also a section on how to prepare your research for consideration for publication and how to present your findings to colleagues. Researching, Reflecting and Writing about Work will be of interest to all those on counselling courses, or training as psychotherapists, as well as people involved in professional learning linked to the helping professions, including those interested in work-based research linked to therapy in any setting. "This is an important book. For the first time the gamut of diverse training programmes for therapists are linked in a systematic and productive way with the research methodologies currently in use." - Rom Harré, from the Preface. "By providing examples of the experience of counsellors in pursuing research projects that have meaning and value for their clients and themselves, the contributors to the book are able to show that research can indeed represent a significant means of extending and deepening insight and understanding in ways that are relevant to understanding the purpose and process of therapy, and which enhance rather than undermine the therapeutic relationship." - John McLeod, from the Foreword. Gardner, Introduction. Gardner, Coombs, Learning and Researching as An Adult Professional. Gardner, Coombs, Ethical Dilemmas in Training and in Research. Gardner, Coombs, Using the Case Study Approach for Training and Research. Gardner, Coombs, Choosing a Research Paradigm. Whitehead, Research Using Focus Groups in An Organisational Setting. Barnet, Research in the Voluntary Sector. Larcombe, Research in the Public Sector. Cole, Research in the Community with a Feminist Approach. Larcombe, Gardner, Coombs, Going Public – Getting Your Work out to a Wider Audience. Coombs, The Way Forward. Fiona Gardner is the Award leader for the Professional Master's Programme in Counselling and Psychotherapy Practice at Bath Spa University. Steven J. Coombs is Head of Department for Continuing Professional Development, Teaching Fellow and Chair of the Professional Master's Programme at Bath Spa University.